A little sports talk . . . 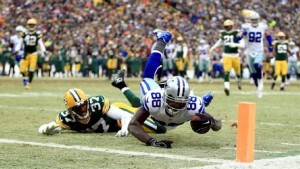 THE DALLAS COWBOYS WEREN’T HOSED by the refs Sunday in their playoff loss to the Green Bay Packers. They were hosed by a convoluted NFL rule applied only after a deft replay review demanded by the Packers head coach. “NFL” and “convoluted rules” are intertwined, if you haven’t noticed. It’s a circumstance, spun far out of control, that needs to change in order to bring common sense back into the game and to eliminate a creeping and suffocating referee nannyism. This particular rule, having to do with a receiver controlling the football after tumbling to the ground following a catch, is a few years old. With the advent of the zoom lens peering everywhere, and from multiple angles, the NFL’s intent was to be sure no receiver got away with anything, i.e. half-catching the ball, as it were. That’s why it wasn’t good enough for Dallas’ brilliant Dez Bryant to out-duel his defender with a leap, catch the ball, and run with it, secure in his hands, for two steps before being tackled just shy of a touchdown late in Sunday’s 26-21 loss. It wasn’t good enough because the ball popped from Bryant’s grasp – and back into his arms — when it hit the ground upon his reaching it toward the goal line. 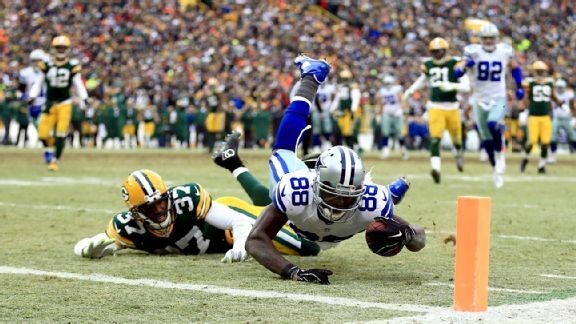 In every sense of football, athleticism and fair play, Bryant made a spectacular catch that might have set up his team to score the game-clinching touchdown. He caught the ball. He ran with it. He had full control of it in those crucial seconds. Easy enough to understand. After seeing the reception rule interpreted in correct, but unfortunate, fashion Sunday, the same disclaimer should be applied. The NFL should not allow the ground to nullify a receiver’s catch if he has obvious control of the ball when he hits the ground FOLLOWING CONTACT. Catch. Run. Control. Two feet in bounds. That’s a catch. That’s what we all know, and what we’ve always known. The eye-test, whatever you want to call it. Or as a guy on Twitter reminded me was once urged by John Madden, if three guys watching in a bar know it’s a catch, it’s a catch, come on already. Then again, expecting the ultra-corporate, multi-billion-dollar generating NFL to relax and let the game happen is like asking for world peace. The unintended consequence of finicky rules and fine-tooth replays in the NFL is continued iron-fist suppression of the game’s spirit. There are enough controversies already swirling around football to rob its supreme athletes of what should be supreme moments. DON’T LOOK NOW — OH, THAT’S FINE, LOOK — but the University of Virginia’s basketball team remains undefeated (15-0) and will be ranked second in the nation behind Kentucky when this week’s Associated Press poll is released today. (The poll is out; No. 2 it is.) Duke will drop from the second spot after losing to North Carolina State on Sunday. Of course coach Tony Bennett’s team is a strong challenger to the crown should it keep all the pieces intact, i.e. prevent injuries from disrupting its flow. The Cavs still play lockdown, relentless half-court defense better than anybody – they lead the country in fewest points allowed per game 51.1. Teams HATE playing against lock-down half-court defense about as much as purist fans of basketball’s free-flowing motion hate the resultant rock fights, but such is life. Their attention to defensive detail and commitment to making the life of the other offense hell remains striking. What stands out as different about this team, even from last year when the Cavs were 30-7, won the ACC and reached the regional semifinals, is they score much easier. Dangerous pairing, that one. They average 71 points a game, five more than last season. Junior Justin Anderson averages 15 points but has made 56 percent of his 3-point shots – 36 of 64, which is just ridiculous accuracy. Super-steady point guard London Perrantes is back with a 3-to-1 assist-to-turnover ratio. And big men Mike Tobey and Darion Atkins – fyi, the team’s only senior – are an efficient duo combining for 13 rebounds and 57-percent shooting around the bucket. U.Va.’s calm, confidence and savvy, personified best by classy junior guard Malcolm Brogdon, stand out in a quiet way against the drum-beating for other programs with higher-profile recruits and more NBA prospects. Try as media star-making apparatus might, the college game remains first about chemistry and teamwork, which is also why Kentucky and its roster of heralded talents deserve credit for blending well, so far, amid all those egos. Duke as well, bad Sunday and all. These are teams that get what the sense and value of “team” are about. All are worth watching as the long season strides toward March’s tournaments. It’s just that the team in Charlottesville has already proven it stands as great a shot as ever, and of any around, to stand alone at the end. TONIGHT, IT SAYS HERE OREGON WINS the national college championship in a high-scoring, entertaining match with Ohio State, which, repeat after me, has lost only to Virginia Tech (which finished 7-6) in the second week of the season. That was early September, a long time ago, way too long for a college sports season to endure, which remains part of the cloying hypocrisy of the NCAA, which rivals the NFL for over-bearing. Ah, but I admit, or I suppose, I’ll watch with interest — but yes, with a few pangs. I am amused — bemused? — that Buckeye’s quarterback Cardale Jones, who started the season the third-stringer, is a 22-year-old SOPHOMORE, although I do appreciate that he tweeted a couple years ago, in a moment of honest frustration, the pointlessness of being required to go to class when he was recruited to play ball. “We ain’t come to play SCHOOL,” Master Jones artfully tweeted to, it turns out, his regret as his constant back-tracking and smoothing over during this game’s ceaseless build-up has droned on. The solution, of course: Pay that man for his time, Ohio State, and for some slices of pizza after practice. He ain’t come to Columbus to play school, and you know it.